DFDL Myanmar is pleased to announce the publication of the 2018 edition of the Myanmar Tax Pocket Guide. 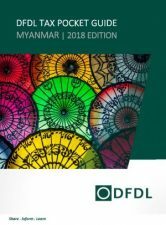 Written by DFDL’s tax experts, this comprehensive guide offers a clear and detailed insight on taxation laws and practices in Myanmar. While tax law can be notoriously difficult to decipher in emerging markets, DFDL offers a simplified guide to ensure that individuals and companies can negotiate and understand local tax practices and laws in Myanmar. This Guide provides an easy to read summary of the key taxes in Myanmar including corporate and personal income tax, withholding tax, commercial tax and other related taxes. DFDL is a full-service international legal and tax firm that offers its clients high quality standard of tax advisory services, and assistance with international tax planning, mergers & acquisitions, tax compliance, and public sector advocacy services. Our regional tax practice comprises of experienced partners, directors, and advisers, all of whom have extensive practical experience in advising large globally listed companies to small and medium-sized businesses.